This kicks off our summer series about enjoying in-season organic produce. Learn simple tips for highlighting summer’s bounty in fresh, well-spiced meals! Could there be a better-tasting or healthier vegetable to kick off the fresh produce season at your local market than springtime asparagus? These emerald green spears burst from the ground containing a complex flavor of earthy, sulfurous minerality and vibrantly green vegetal sweetness. 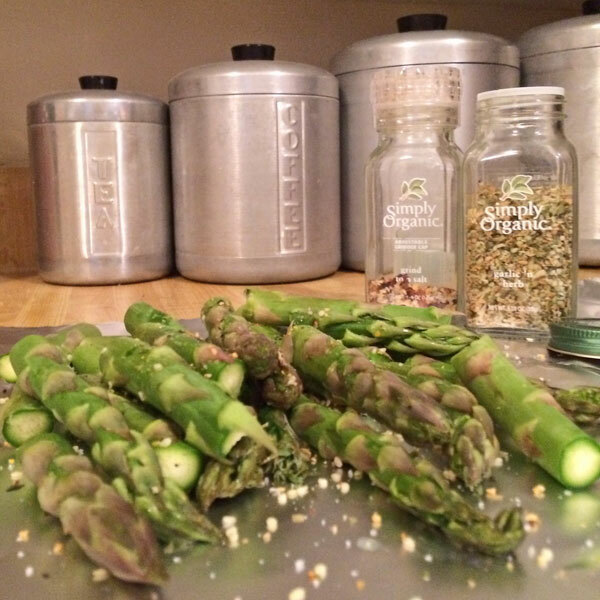 Simply Organic Garlic ‘n’ Herb and Grind to a Salt make perfect seasonings for simple, grilled asparagus. How to prepare it: There’s simply no wrong way to enjoy asparagus — except overly boiled into mush! Steam and adorn with butter, salt and pepper, grill with olive oil and garlic, broil with balsamic vinegar, or munch raw with a seasoned creamy yogurt dip. Spices and herbs to complement: Try asparagus with delicate, green herbs like parsley, chives, tarragon and chervil. Pairs well with: Enjoy asparagus with salty, creamy dairy such as butter and cheese. As a versatile side dish, asparagus goes well with delicately cooked eggs and fish, or more substantial fare such as a grilled steak and baked potato. Slim, medium or thick? They’re all good, just choose similarly sized spears for even cooking and adjust your cook time accordingly. Peel the fibrous bases of thick spears or trim them away. Steam, sauté, broil or grill the spears to an al dente texture. Avoid boiling them. Don’t use an aluminum pan or pot as the chemistry of the asparagus can react with the metal to taint the flavor. For optimal flavor and tenderness, use asparagus immediately — it tends to get woody and tasteless if stored in the fridge too long. What are your favorite ways to enjoy asparagus? Share them in the comments!